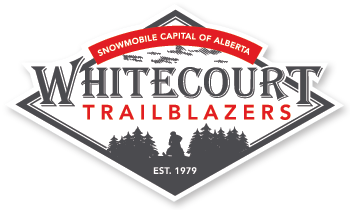 The Whitecourt Trailblazers Club currently maintains 465kms of trail system in the Whitecourt area, including portions of the Trans-Canada Trail System and the Golden Triangle Trail System. Check out the Trailblazers NEWS for up-to-date trail conditions or phone the Sno-Line at 1-800-313-7383. An overview of the trails and facilities. 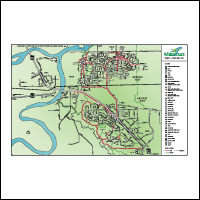 A detailed map of the trails and facilities including GPS points, distances and an inset of the Golden Triangle Map. NOTE: Not recommended for smartphone downloads. 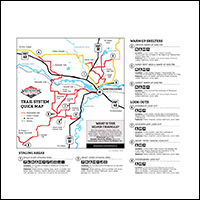 The Whitecourt Trailblazers have provided a GPX file to download which includes all Trailblazers trails plus GPS points for warmup shelters and trail crossings. The GPX file should work with most personal GPS systems (ie. Garmin) and will correspond to maps on trails. 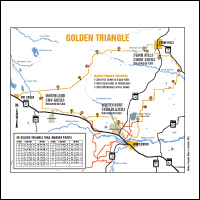 A map of the Golden Triangle including GPS points and distances. The 350km Golden Triangle Trail connects the communities of Whitecourt, Fox Creek and Swan Hills. The trail consists of varied terrain with warm-up shelters located throughout the trail system. 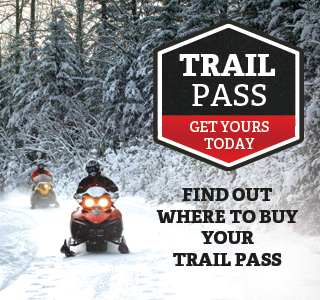 Please visit the Golden Triangle website or call the Sno-Line (1-800-313-7383) to check trail conditions before planning to ride the Golden Triangle. 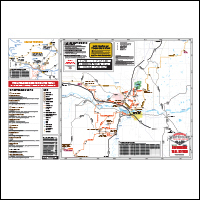 A map of the Town of Whitecourt showing the designated snowmobile trails. NOTE: Snowmobile Trail through Millar Western CLOSED due to erosion of the river bank. Whitecourt is one of the few communities that permits residents to operate snowmobiles within the town limits. Snowmobiles are permitted on designated trails only. The maximum speed of operation for an OHV within Town limits is 20 kilometers per hour. It is important to know that Centennial Park is within Town limits. For more information, please review the OHV Bylaw.